The purpose of Northern Arizona University Internal Audit is to provide independent, objective assurance and consulting services that improve the operations of NAU. 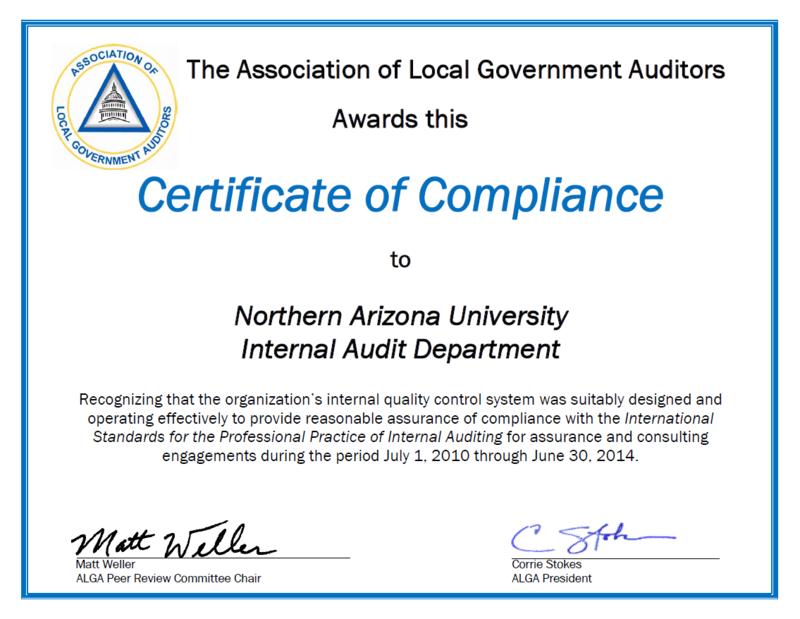 Internal audit reviews help NAU accomplish its objectives by bringing a systematic, disciplined approach to evaluate and improve the effectiveness of business, risk management, control, and governance processes. The internal audit charter, which is approved by NAU executive leadership and the Arizona Board of Regents, outlines our purpose, authority, and responsibilities, which is consistent with the mission of Internal Audit and the mandatory guidance established by the Institute of Internal Auditors. The internal audit plan outlines the audits to be performed each fiscal year and is approved by the Arizona Board of Regents. The plan is based on the annual risk assessment of the University, as well as input from ABOR and NAU management. See this year’s audit plan. The audit process involves the client from start to finish, to ensure communication and transparency as the audit evolves. Each step of the audit process is important to identifying enhancements or improvements as part of this evolution. Learn more about the audit process, including what you can expect, why you are being audited, and what type of audits our office performs. While the objectives of each audit will vary, we follow a consistent audit approach designed to establish a well-defined project scope in order to promote communication, maintain independence and objectivity, and avoid confusion. Most audits follow these steps. As part of developing the annual audit plan, potential audits are identified as a result of board policy, requests for audit work, requirements of the University, and risk assessment. Based on this assessment, the decision to audit a department is made. See how risk is assessed at NAU. There are seven categories of risk for which related controls are assessed by Internal Audit. Learn about the various types of audits or projects we perform. 545 E. Pine Knoll Dr.